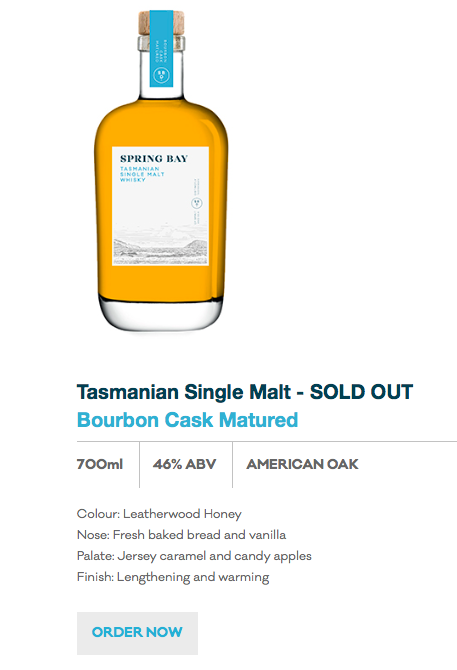 Tasmanian whisky is very expensive. Why? The expense of Tasmanian whisky was not a topic I was daredevil enough to explain in my book, but a facebook post in Australianwhisky (November 2018) by Ryan Marshman inspired me to offer the text below. Local distillers acknowledge that Tasmanian-made whisky is expensive, but that is an understatement. Though typically aged for half the average time, they are triple the price of the average bottle (as the bottles typically contain only 500ml of fluid, their 700ml price is 30% higher). This may make them, per maturation day, per millilitre, the most expensive whiskies on earth. How can their price be explained? First, an example: even at the height of its downfall, and with journalists attacking Nant Distillery owner Keith Batt’s business, no one questioned the quality or price of his whisky. Indeed, the whisky was praised as a very fine drop. On what evidence? After ten years, Nant had only one badge of honour: a Jim Merry liquid gold. No awards. Even tasting notes by knowledgeable whisky writers are rare. Yet it is one of the most expensive brands. Another example: Behind the counter of a small bottle shop on the little hill of West Hobart I saw a new bottle of Tasmanian whisky standing on its own information sheet. It was the first release (at two years old) from the Spring Bay Distillery, on "sale" for $280. For one bottle. It was so expensive I looked up and down the shelves for anything more expensive. There was nothing. For half this price in this same shop I could have ten year old Laphroaigs, prestige Aderbegs, or a 16 year old Taliskir, I could have a top shelf Johnnie Walker Blue Label in its cavernous box, with nothing in it less than 21 years old. I could buy centuries of tradition and expertise, but for this Tasmanian toddler, all of 2.1 years old, matured in some Makers Mark, ex-Bourbon cask, I would need $280. The sales sheet explained that it had been made by hand in salty air on the east coast of Tasmania. The sheet did not note that it had been made in an unknown distillery (if that matters) by a novice (if that matters) in a new still (if that matters). I asked the bottleshop attendant if he could find anything more expensive in the shop. He looked along the shelf and said, "Yes", pointing to a bottle of Sullivans Cove whisky. It was $350. A week later at the Hadleys Hotel whisky bar in Hobart I glanced down the Tasmanian whisky menu. Most nips were around $30, but the one that stood out was the Nant. A shot of this five-year-old, cask strength, single (ex-bourbon) cask whisky cost $60. If we judge by price these whiskies must be some of the best in the world. Why so expensive? I asked the barman. All single cask whiskies are endangered. That $280 Spring Bay whisky, too, is rare, with only a couple of hundred bottles ever filled. Killara Distillery’s first batch was a mere 30 bottles. Express-matured in minuscule casks for two years, after the angels stole five litres from it, the remaining 15 were poured, cask strength, into 30 bottles. The bottles were priced at $1,200.00 each. Each! Killara’s distiller emphasises the hand-blown black bottle and the Huon pine box as well as the rarity. Bill Lark argues that the Tasmananians are priced “differently” because they are not like the others. The hand-crafting and rarity and quality of the products put them into a different (read higher—but no offence, Scotland) class. That they are anything but average. Nonsense. I figured such prices are not related to refinement or rarity; such prices are effectively arbitrary and therefore more a reflection of the ego of their price-setter, but the refined economic theory of "Conspicuous Consumption" proposed by economist Thorstein Veblen is more focused on the money. Whisky pricing is not governed by the ordinary laws of economics. Veblen's Theory of the Leisure Class explains why some people pay highly exorbitant prices for some products: it is because they are leisured and their social role is to engage in conspicuous consumption of such goods. It is how they themselves define living. By buying products whose price far exceeds their value—the very definition of "luxury goods"—they perform their economic role. If you have a lot of leisure, Tasmania has a little whisky for you. * Footnote: The industry has won many awards (awards: their plethora and the prices paid to win them is another story) and a Spring Bay whisky was judged among the top four Australian whiskies in a survey published in the Financial Review in 2018.